These slim line soft serve machines produce the best tasting gravity-fed frozen desserts…smooth, creamy and consistent yogurt, ice cream or sorbet! The 22”(56.20cm) wide footprint allows for more units in a smaller space. 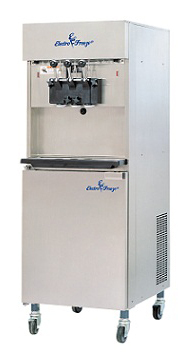 The SLX500 is the perfect yogurt shop freezer and is great for adding flavors to ice cream shops, too! Great for QSRs, retirement villages and hospital cafeterias.